Four top-class woodturning demonstrators will take to the stage over the weekend to inspire, educate and entertain, showing best practice for turning, decorating and finishing. Most them will be in the hall when not on stage, available to chat to and ask questions. There’s lots of other things going on too; before the on-stage demonstrations start, during breaks and after the demos have finished our Weekender Clinics will be open, offering help and advice on all and any woodturning related problems. There will be several different Clinics available, each dealing with different aspects of woodturning, with experienced staff on hand to offer advice and remedies for whatever ails your woodturning. Expect lots of help, information and demonstrations. No appointment necessary! This exciting event is for woodturners from novice to expert, to not only learn from the demonstrators but also to get together and share their advice and stories with each other. Hopefully we’ll have a few laughs too. Come on Saturday, Sunday or bag-a-bargain and stay for the whole weekend. And join us on the Saturday evening for an informal meal and a few surprises! 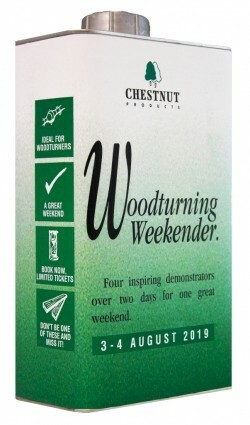 Click here to get the Woodturning Weekender news first! Click here for the full running order and schedule. If you’re travelling with a non-turning partner don’t worry, there’s loads in and around Springfields for them to do. Visit Springfields Event Centre for more information and suggestions. There will be lots going on during breaks in the main demos, before and after them too, we’re just collating all the information and will be posting it soon! It’s hard to believe that Chestnut Products has been around now for over 25 years! Starting from very humble beginnings we’re now supplying woodturners and woodworkers all over the UK, Europe, USA, South Africa, Japan and Canada, with more to come. The fact of the matter is we missed our 25th Birthday. It was only whilst doing some paperwork at the end of 2017 that Terry realised it had been and gone and we were sad to realise that we’d missed it. The business started during a recession and has weathered another one since then so it’s an achievement to still be here. And we missed it! We could wait until we’re thirty but frankly that doesn’t have the same ring to it, and besides, that would be the normal thing to do – and we do try to do the unexpected sometimes! So that’s the reason for the weekender – and the best news of all is that you don’t need to bring us a present!